Gin cocktails, canapés and live jazz…all in the luxurious Arch Bar at the Intercontinental Hotel, Park Lane. What a lovely way to spend an evening! 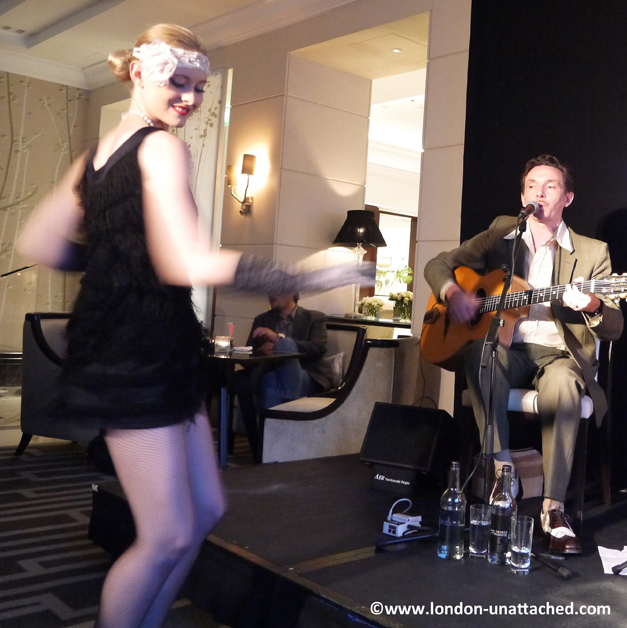 Once a month the Intercontinental Park Lane hosts a live jazz evening where you can sip cocktails in style, watch the lovely Katy strut her stuff and listen to some funky jazz. 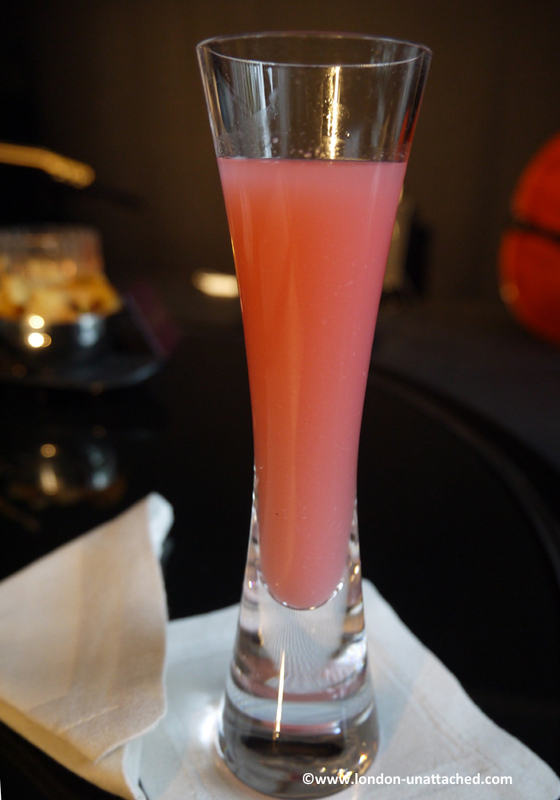 There’s no booking charge and you’ll get a complimentary Pink Lady. Gin Cocktails are £10 and there are a couple of sharing platters if you are feeling peckish. I went along to see what all the fuss was and had a ball. Our complimentary cocktail was delicious. Pretty, VERY pink and made me feel slightly decadent. It arrived with a little platter of bar snacks. 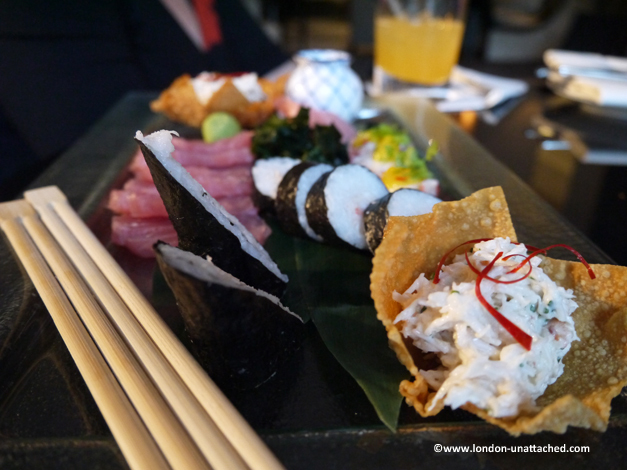 We ordered a couple of gin cocktails and a sharing platter called ‘The Cat’s Meow’ which was exactly what we needed…a range of sushi that we could nibble at while we sipped our cocktails – Sashimi of Tuna with lobster maki, wasabi, soy and Tobiko caviar, Scottish lobster and mango salsa and crab chilli won tons. After the special cocktails we wanted something simpler and enjoyed a Blooms gin served with tonic and fresh strawberries from a selection of over 30 gins on offer at the hotel bar. 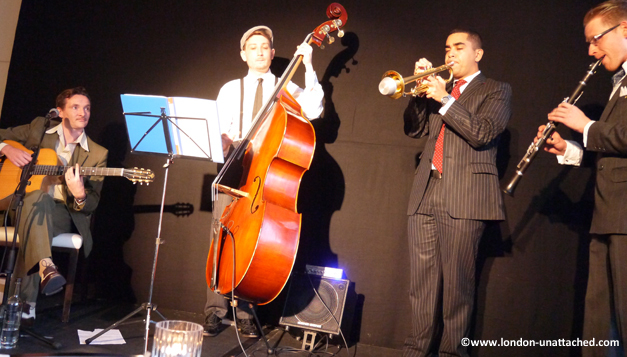 We were invited to Gin and Jazz as guests of the Intercontinental Hotel. Oh for goodness sake Fiona, you get to go to all the fun places! First it was champagne and cheese and now Gin and sushi, what a party girl you are. It was a lovely evening – the poor trumpet player had to close his eyes in the end when Katy was wiggling near him! 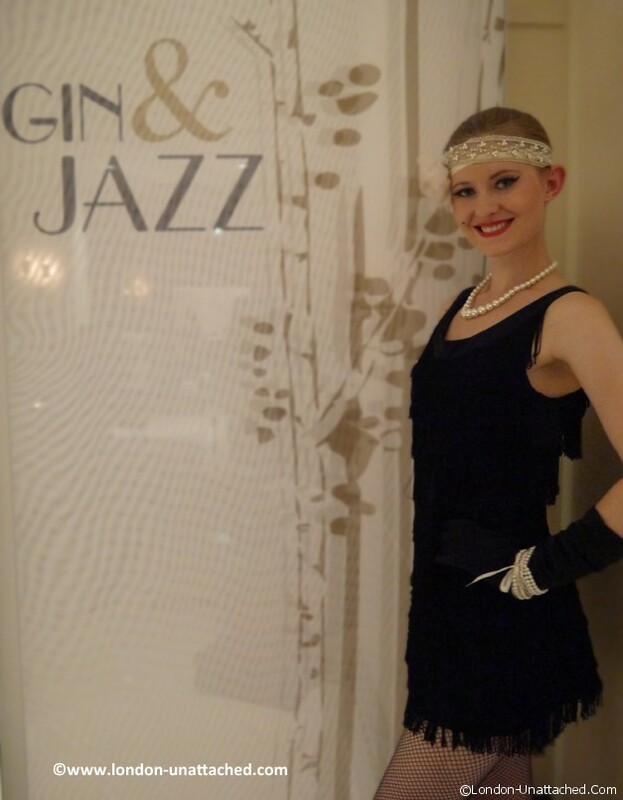 Gin&Jazz’ at The InterContinental London Park Lane is set to continue for 2012 due to popular demand. The evening is a sumptuous celebration of live golden age jazz and classic cocktails and takes place on the third Thursday of every month. Oh what a lovely surprise! I worked for IHC for over a decade and loved every minute of it! While I was based here in Maui, Hawaii I had the pleasure of staying at the IHC Park Lane during the first of many trips to Europe. Thanks for rekindling lovely memories!